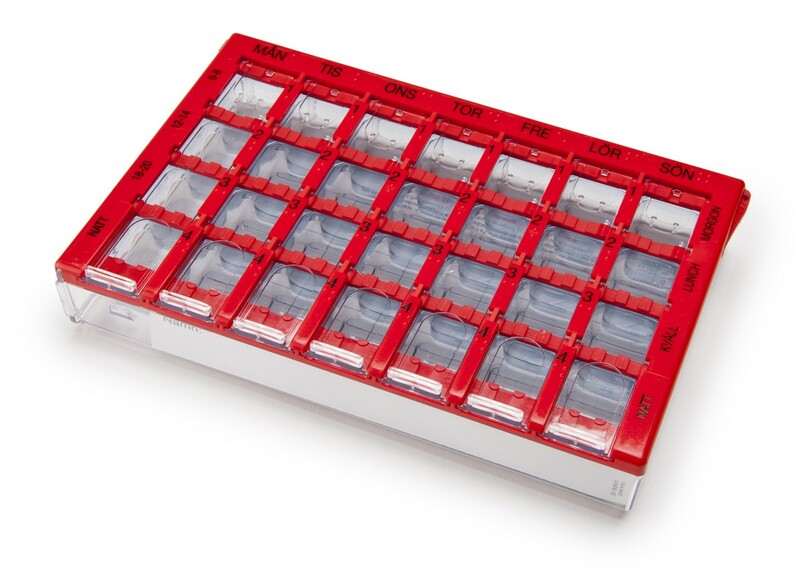 Dosett® is a storage container which stores and organizes a week’s worth of vitamin supplements and medicines. To function as they should, vitamins and medicines must be taken as prescribed. It is therefore vital to take the right dose of the right medicine at the right time. We generally have no problem remembering to take a painkiller when we have a headache or a sleeping tablet when we can’t sleep. Many medicines however are taken for preventive purposes, which means there are no acute symptoms to remind us. Dosett® makes life that bit easier: One week’s dosage of medicines and/or vitamins, organized using Dosett®, makes it easier for you to control your medication. Child safety and user instructions are enclosed. Dosett® Maxi is equipped with a prescription chart which can easily be changed when no longer current. Dosett® Maxi also has a detachable insert which can easily be removed for cleaning or for replacement. If the size doesn’t meet your requirements, try Dosett® Medi or Dosett® Mini.